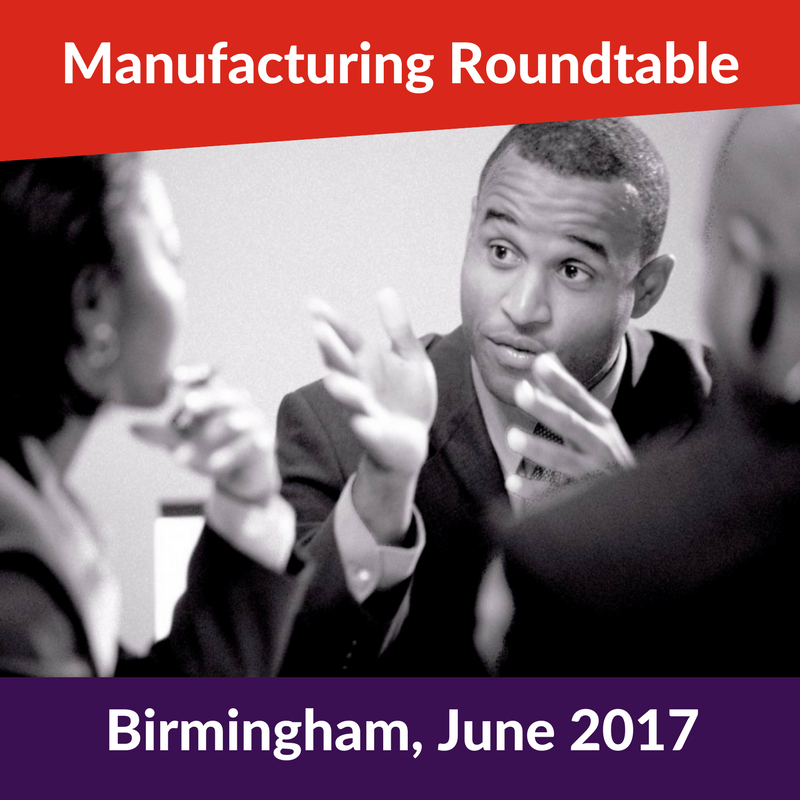 Manufacturers Roundtable, Birmingham June 2017. We had the pleasure of being invited along to take part in a roundtable dinner event last week designed specifically for business leaders in UK manufacturing to discuss the issues the industry was facing and how they plan to deal with the challenges these issues posed. It was an evening of lively and passionate discussion. The discussion kicked off with a topical question to get everyone warmed up, ‘’What does the term Industry 4.0 mean to you as UK Manufacturers?’’. The range of responses to the question was unsurprisingly broad given that Industry 4.0 itself spans the entire manufacturing operational function and there isn’t really one definitive answer. Responses included: the automation and digitisation of processes and operations, the change in skill sets required for manufactures to remain competitive, the removal of inefficiencies across an organisation, a way of identifying new business opportunities within existing operations. What was interesting from our neutral perspective was that each person tended to home in on a key aspect that was most relevant to them and their business: so even though the topic itself is very wide reaching, it’s important to get to the nub of what it means specifically for each business. Just as each manufacturing organisation is unique and faces different challenges, so too is their perception and indeed approach to Industry 4.0. >ERP is still a key focus area for manufacturing businesses. From the discussion, it was apparent that a lot of the manufacturers were either struggling with a legacy ERP, trying to adapt to a newly implemented system or failing to drive out the full value of ERP. The reasons for these ongoing issues all seemed to centre on one main cause, the cost of resolving the issues. In order for manufacturers to accept the associated costs of ERP projects, there obviously needs to be more work done to demonstrate a tangible business case so that the business value and benefits are clearer. That was a key learning point for us. >Machinery upgrade and replacement costs are seen as too much of a financial burden due to concerns over the market with Brexit etc. This point was expressed from 2 different perspectives. On one side there were some organisations that had made the investment in to new machinery and had refitted an entire shopfloor at significant cost. They were reporting that although they had seen improvements in output, they weren’t expecting to see a real terms return from the investment for some time. On the other hand, there were manufacturers describing how they were dependent on machinery that was no longer supported or being produced anymore. This meant that their maintenance costs were rising year on year. An interesting point here was that these organisations recognised the need for change but the scale of the change was seen as to much of a risk to take. By replacing a key machine they would also need to replace or adapt surrounding equipment and also change the corresponding processes too. This is an issue that is effecting many organisations, the need for change is understood but due to the risks and costs it is being delayed. Obviously the concern is that it could be delayed until the point of business failure. >The cloud is still seen as being a security risk. Another insight from the manufacturers in attendance was that they all held a view that keeping their data in house and managed locally was safer. They described how the news stories of data breaches and fines were enough for them to hold off embracing cloud technology. It was at this point that a member of the group raised that with Industry 4.0, the internet of things and increased mobile working, the risks of threats to data security was increasing. Building on that, the point was presented that unless your organisation has a high level of IT skill capacity, maybe utilising a specialist cloud supplier to bear the responsibility of data security was a way to free up budget and concerns. There was much toing and froing on this! >Not making full use of the data at their disposal. A consistent over-arching point across all these areas was a view that the manufacturers represented understood that they were not utilising the potential of the data being collected across their businesses. Some of the stand out reasons for this were that they didn’t have the internal skills nor the capacity in terms of time to spare to analyse and respond to the data.